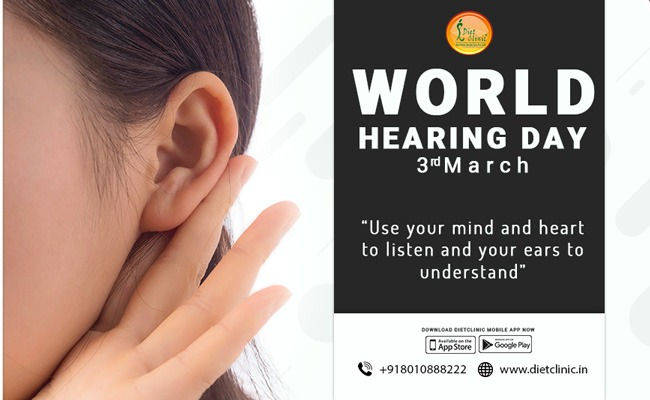 The idea behind observing this day is to create and design campaigns to raise awareness on hearing loss and encourage people to take necessary precautions and actions to defend it. According to studies that are estimated at around 360 million people all around the globe living with hearing loss disability. This day promotes hearing loss as a public health issue and deserves a priority status. A sole effort by the WHO, through this day, tries to draw attention on the early identification and intervention on hearing loss. The problem lies with many, who are not able to identify, unidentified hearing loss and often failing to understand and realize that they might be missing on certain sounds and words. Therefore, at Diet Clinic it is believed that the first step towards identifying and stopping the issue to get hearing checked and addressing if there are any such issues. Explaining the importance of ear care and make it affordable and accessible. Promote early identification and management of hearing loss. Provisions of early treatment and rehabilitation. Give priority to early detection and prevention. Early identification and prompt intervention. Help partner organization and local levels to extend and create awareness. Local availability of treatment facilities at primary health care levels. Accessibility contemplating the local aspects like geography, logistics, structure, and communication.